Ajay Sanders with the jumper as Coastal Carolina beats Arkansas St.
JONESBORO, Ark. 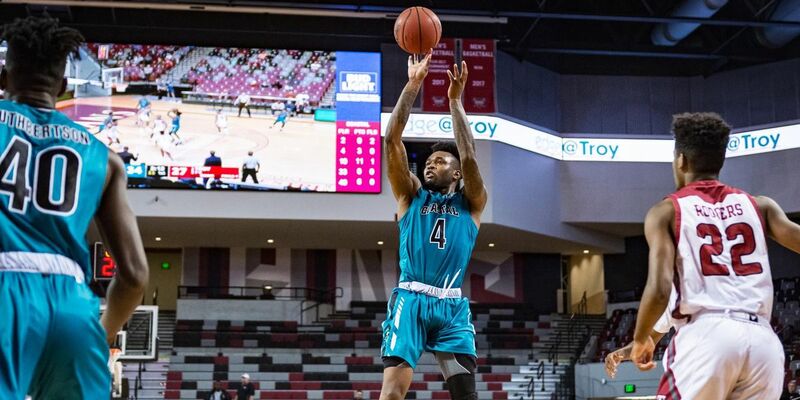 – Zac Cuthbertson and DeVante Jones scored 16 points each to lead Coastal Carolina to a 77-64 road win at Arkansas State. The win for the Chants was their third consecutive win, giving them their longest winning streak of the season. The Chants had two other players reach double digits as Ajay Sanders scored 15 and Ebrima Dibba added 10. Coastal held the lead for the entire second half, but the Red Wolves made several runs to cut the lead to single digits several times in the final 20 minutes of action. With the Chants leading 58-50 and the momentum in the home team's favor, the big shot from CCU came from Jones who nailed a three with the shot clock winding down to put CCU up 61-58 with seven minutes left in the game. CCU maintained a double-digit lead throughout the final minutes. CCU shot 48 percent (28-58) from the field and also hit 48 percent (10-21) of its three-point attempts. CCU did struggle at the charity stripe hitting just 11-of-18 attempts for 61 percent. CCU's defense did a great job on ASU's leading scorer Ty Cockfield, who came into the game leading the Sun Belt in scoring at 21.5 points per game. He finished the game with only six points on 2-of-11 shooting. ASU's lone double-digit scorer was Tristin Walley who finished the game with 14 points, 12 of those coming in the first half. ASU finished the game shooting 41 percent (22-54) from the field and only hit five three's while connecting on 22 percent of those. ASU hit 15 of its 24 free throws for 63 percent. The Chants shot 52 percent in the opening half to carry a 40-27 lead into the locker room at halftime. Sanders led the way with nine points with Cuthbertson and Dibba scoring seven each in the opening period. CCU also did a good job on its three-point attempts knocking down 6-of-12 for 50 percent. The Chants only got to the free throw line a couple of times in the first 20 minutes of play but missed all three of its attempts. Walley had 10 points to lead the Red Wolves on 3-of-4 shooting in the first half. Shaquillo Fritz had four points as the home team shot 39 percent from the field before the halftime break. The Wolves hit three of their 11 three-pointers for 27 percent and hit four of their 10 free throws for 40 percent in the first half. The Chants will be back home for two games beginning with a matchup against Louisiana Monroe Thursday, Jan. 31 at 7 p.m. (ET).